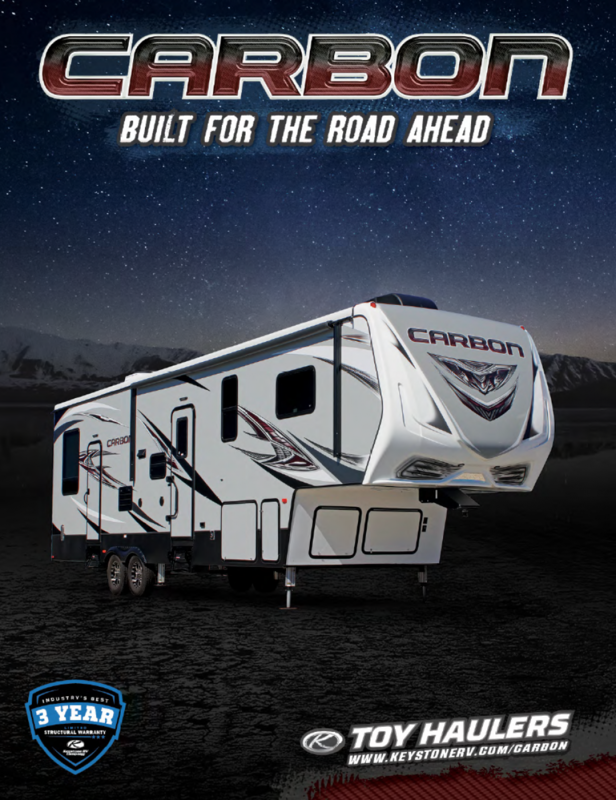 For family fun and great memories, this 2020 Keystone Carbon is perfect! Lakeshore RV Center wants you and your family to make wonderful family memories and there's no better way than in this Keystone 5th Wheel Toy Hauler! We'll help you reach your dream of RV fun, and we're with you every step of the way. Here at Lakeshore RV Center, we guarantee the lowest prices and the best deals - always! Visit us at 4500 E Apple Ave Muskegon Michigan 49442 or give us a call at 231-788-2040. We'll make sure you get the RV of your dreams! With a GVWR of lbs, a hitch weight of 3410 lbs, and a dry weight of 14270 lbs, this RV can go just about anywhere! After the long trip, sit back and relax outside under the cool shade and protection of the 15' 0" awning! Is it chilly outside? Stay warm inside the RV with the 35000 BTU furnace! But, what if it's hot and humid? Then cool down with the 15000 BTU a/c! At a width of 8' 0", length of 43' 6", and a height of 13' 6", you'll be able to walk freely inside this spacious RV! You can expand the interior even further with its 3 slides! Have a home-on-wheels cooked meal with the kitchen! The 106 gallon freshwater tank provides enough clean water for cooking, drinking, and cleaning! Store more food with the 12.00 cu. ft. refrigerator. Cooking is easier with the 3 burner range cooktop. This 5th Wheel Toy Hauler has a gray water tank that holds up to 82 gallons, and the black water tank holds 82 gallons. The 60 lbs. LP tank capacity ensures hot water in the shower, and there is also a Porcelain Foot Flush toilet inside the bathroom! Got lots of outdoor camping gear and toys? No worries with this 5th Wheel Toy Hauler! This RV has room for all your gear and luggage, with its roomy 13' 0" garage and cargo capacity of 4730 lbs. ATVs, motorbikes, or other outdoor toys will fit right in! There's more than one option in this camper if you need to go to the bathroom. In addition to the master bathroom is the half bathroom! It has its own sink vanity and Porcelain Foot Flush toilet!